In this article, let’s go over a few of the new changes Facebook has forced upon page owners with their new Facebook Timeline feature. There are a great many changes and, whether or not you like them, they are very likely here to stay – at least for a while. Facebook’s stats are reiterated time and again. But they are for a reason. Facebook’s 850 million users are active users, 483 million of them use Facebook daily and 425 million are on Facebook through their mobiles – they carry Facebook in their pockets, purses and everywhere they go. Facebook also supports 70 different languages and is quite literally all over the world. These stats continue to grow by the month and Facebook has said they’re aiming for 900 million by the end of 2012 – but many think it’ll be closer to the Billion mark. Facebook also accounts for 95% of time spent on social networks. This means that, of the total time people are spending on social media sites on the Net, Facebook is eating up 95% of that time. Unlike sites like Twitter where people leave quick tweets, Facebook has a huge “stickiness factor” where users are not just checking in and out, they are sticking around, looking for updates, and finding people, pages, groups, games, and more – they are interacting. Facebook first rolled out the new Facebook timeline feature for personal profiles a few months back but people were also given the choice to opt-out of using the new feature. As of February 29th, Facebook began testing this new Facebook timeline layout with business fan pages — as of March 30th, all Facebook pages will automatically change over to the new Facebook Timeline layout. Facebook has given every page owner a month’s grace to test, learn, and edit their new page’s look before they are published permanently in the Facebook Timeline layout – and seen by all their fans and users alike. One of the biggest changes Facebook has made is taking away the default landing pages with the new Facebook Timeline layout. This default landing page was where page owners could send users when they wanted to advertise their brand or promote something. This was also an excellent way for page owners to “force” users to LIKE their page in order to access more of its content / wall. It worked well to convert users into fans but Facebook has said they don’t want businesses being overly promotional. Facebook thinks that all brands have a personality and they want to provide these brands the opportunity to express themselves through the new layout. Pages can no longer force anyone to LIKE their page, they can only offer enough value to users that they want to click the LIKE button. It is important that your page’s Wall (now called the Activity Feed on the Facebook Timeline layout) is designed in such a way that users want to read your updates, to see your pictures, to find out more about your products or services and, most importantly, that they don’t mind seeing you in their newsfeed. Page tabs and apps are still available, although since there is no default landing page, page owners will have to drive traffic to these custom pages if they want users to enter a contest, sign up to their list or give up an email in exchange for a free gift. So what exactly is new with Facebook’s New Timeline? First and probably most notable is the introduction of the new Cover Image – where Facebook timeline pages can display a wide image of their brand. Profile pictures are no longer long and narrow and they don’t appear down the left hand side anymore. Nope, now they are front and center – taking up a large amount of the virtual real estate on your page. There are a few rules which we’ll get into later, but just know that page owners can’t display any ‘calls to action’ or contact info on their new Cover Images. The About section of the Facebook timeline layout is now displayed in a more prevalent space below the cover image and profile picture. Tabs are also found under the Cover Image, giving these two areas more eyeballs focused on what your page is about and what it offers. The new Highlight Feed of the Facebook timeline allows users to view and interact with your page the way they want to. The new Facebook Timeline Navigation lets users easily explore your page’s or business’ past. The Wall has changed to what is now called the Activity Feed – a place where users can view a collaboration of status updates, photos, videos, and other forms of user engagement. The Friend Feed is displayed on all pages and shows users’ posts made by any of their friends about your page. Pinned Posts, Milestones and Starred Stories are three new ways to highlight important updates, launches, promos, etc. within the Facebook timeline layout. Private messaging has been introduced to pages – now fans and non-fans alike can directly send private messages to pages. This is accessed in the new Admin Panel which helps admins easily navigate through their page’s Insights and Messages, as well as view the new Activity Log which shows everything ever posted by the pages admin or its fans. 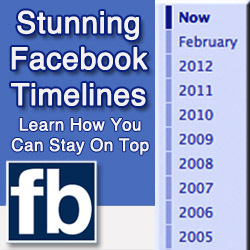 For more information on Facebook timeline for business, there is an outstanding free guide that covers all the Timeline changes in depth — you can download it by clicking here. Los Angeles, CA / USA, June 30, 2011 The website so many people have been waiting anxiously for has now officially been launched. FanPageInc.com specialized in Facebook Marketing, custom Facebook fanpages and Facebook applications. To assist local business owners who may be new to marketing their business on Facebook, there are instructional videos, articles, links to the company’s podcast on iTunes and more content being posted every day. To celebrate Independence Day, business owners can take advantage of $300 instant savings when they enroll in a Facebook FanPage Makeover. With Facebook, it’s possible to create an optimized presence that gets indexed quickly in search engines. Google is not the only channel that picks up Facebook pages, especially since Bing has developed a special relationship with the social network. In addition, Facebook offers demographic targeting in their advertising which allows a much lower CPC (cost-per-click) than other options like Google Adwords. Rather than target keywords, which are similar to search categories, business owners can zero in on specific demographics within their ideal customer base. Are You Making These Facebook Marketing Mistakes? As a follow-up to our previous episode, I discuss a few of the more common Facebook Marketing Mistakes and what you can do to overcome them. Oftentimes, it’s a matter of getting out of our own way that gives us success. Are you guilty of any of these Facebook Marketing mistakes? Comment below. Having Trouble Marketing on Facebook? If you’re having trouble marketing on Facebook, it usually comes down to a few simple problems that can easily be overcome. More often, I have seen just a slight tweak of an overall strategy or approach… a change in perspective on what your Facebook marketing, and your business fan page in particular, should do. What is the overall purpose your fan page should have? Listen in. Leave your comments below. Let me know one difficulty you’re having with Facebook. Facebook Marketing — Is It Really Effective? The question I’m asked frequently by clients is, “Is Facebook Marketing really effective, or just more hype, or yet another thing we “need” to focus on in our online marketing efforts? For an honest answer to that question, please click the link above and listen to today’s podcast. I’d love to hear your opinion on whether you feel Facebook Marketing is effective. How is your Facebook marketing campaign working for you? If you don’t have a campaign per se, then what are you tried with Facebook marketing? Is Facebook Bigger Than Google??? Welcome to the premiere episode of the FanPageInc.com podcast, where I’ll look at the different aspects of Facebook marketing as it relates to YOUR business and how YOU can benefit by maximizing your presence on Facebook. The latest buzz online is that Facebook has finally surpassed the traffic of Google. But does that mean they are bigger or more important than Google? Well, that depends on your purpose — please click the play button above to get in the discussion, and leave your comments below.